Created by Ashley Bruce.This site is run by Edinburgh citizen David Sterratt. He is affiliated to the Electric Tbus Group, a group of transport professionals and campaigners who seek to ensure that trolleybuses are given due consideration for UK public transport schemes. He works as a computational neuroscientist at the University of Edinburgh. 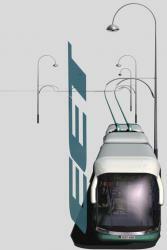 Thanks are due to the members of the Electric Tbus Group, whose collective expertise has informed this site. Particular thanks are due to Ashley Bruce, who created the composite images and John Fuller, for the modern trolleybus images.